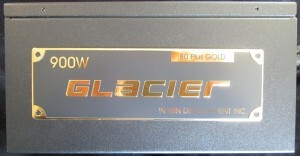 Today, we’re looking at InWin’s new Glacier 900 W power supply. 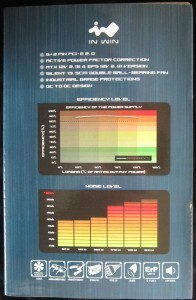 It’s an 80+ Gold rated, modular cabled unit with a nice looking spec sheet and a staggeringly long seven year warranty. Sounds pretty good to me! I’ll give it a taste of hell with my load tester, peer into its secret high frequency workings with my oscilloscope, and lastly crack it open to see if any wooly mammoths are inside the glacier. If I don’t find frozen mammoths, I’ll look at the build quality and see what components were used. 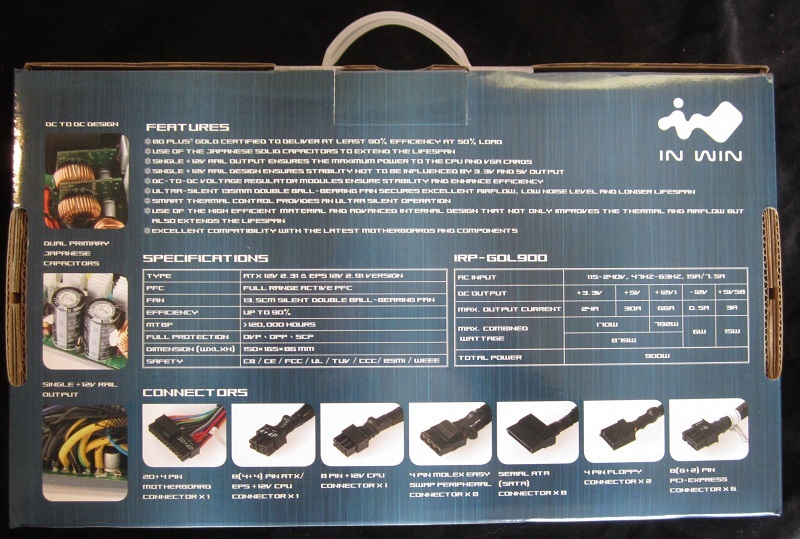 Direct from InWin’s product page, we have the features list! 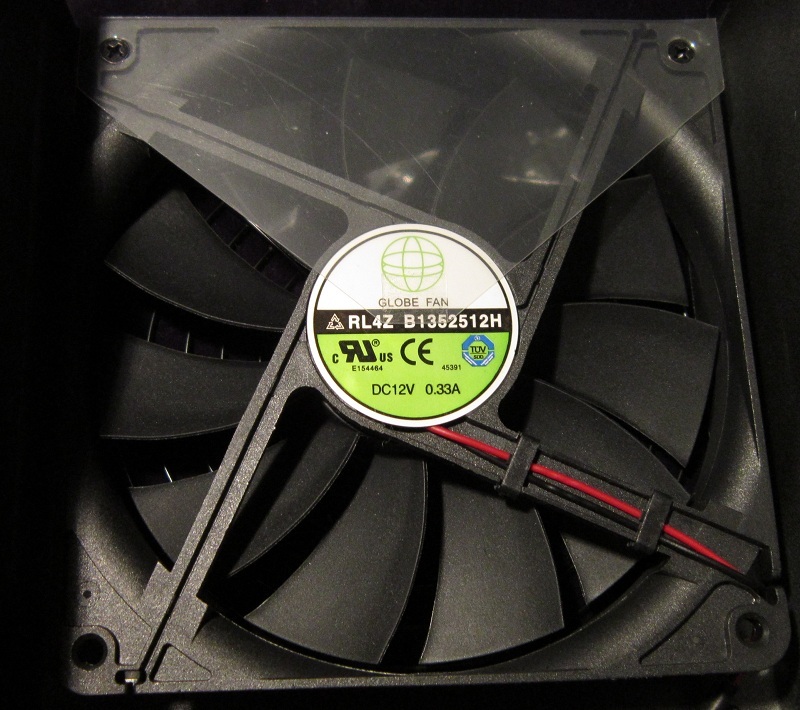 Ultra-silent 135 mm double ball-bearing fan secures excellent airflow, low noise level and longer lifespan. 80 Plus gold certificated to Deliver at least 90% efficiency at 50% load. 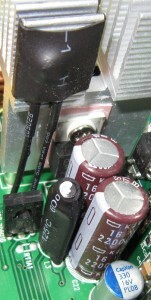 Use of the Japanese solid capacitors to extend the lifespan. DC-to-DC voltage regulator modules ensure stability and enhance efficiency. Modularized Cable management system designed to eliminate clutter and improve case airflow and cooling. Single +12 V rail output ensures the maximum power to the CPU and Display cards and the stability not to be influenced by 3.3 V and 5 V output. My thoughts? 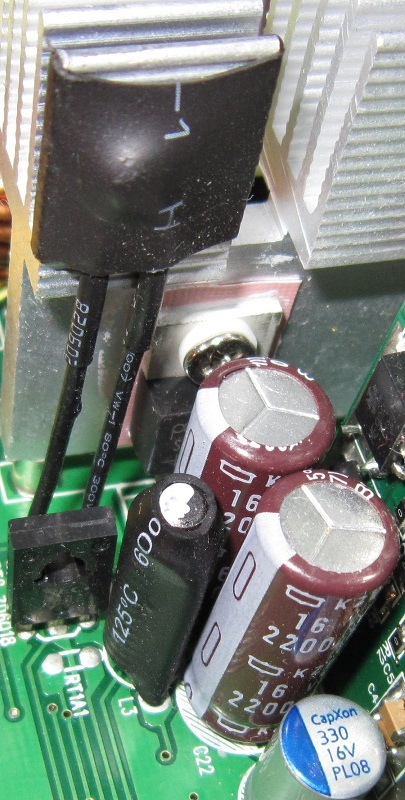 Well… The capacitors in the picture don’t look like what most people call solid capacitors to me, admittedly what most people call solid capacitors aren’t especially solid either. 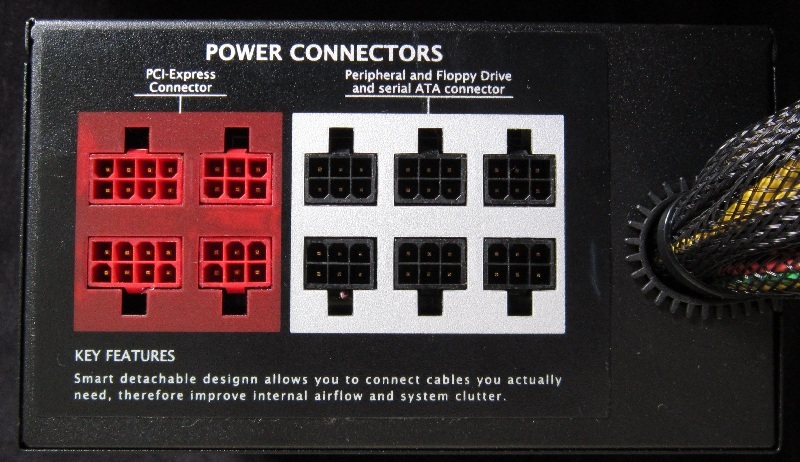 The connector list looks great, we’ll see what is hard wired and what is modular later on. 135 mm fans are nice. 80+ Gold is great. DC-DC 5 V and 3.3 V rails are pretty much required to hit 90+ Gold, so their presence isn’t a surprise. I am definitely a fan of modular cables, though I must say that the fat bundle of hard wired cables in the picture concerns me. Last is the single 12 V rail, those I am less fond of. There is a long winded and complicated explanation, but the short version is that well designed multiple rail PSUs do everything a single rail can while being safer. 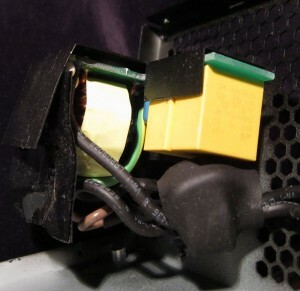 In certain failure modes single rail PSUs can cause serious issues. The number of 12 V rails has little to do with whether the CPU/GPU is influenced by the 3.3 V and 5 V rails, so I don’t know why that is mentioned. Moving right along, the official specifications! The InWin site is fairly brief about the specs, so I’ll be including a picture of the PSU label for rail wattages and such. 792 W on the 12 V rail is surprisingly low and really doesn’t make a whole lot of sense as every watt that come out the 5 V and 3.3 V rails first goes through the 12 V. That said 792 W of 12 V on a 900 W is generally considered perfectly acceptable, it’s only the recent DC-DC regulation crazy that has led to 12 V ratings near the entire unit rating. Of course, this is a DC-DC unit. In any case we’ll move onward to testing at this point as I can only comment on a label for so long before I start to repeat myself or diverge on wild tangents. We’ll start our photographic expedition with the box, as usual. Or is this the top? Alternate bottom, this one with marketing. This is definitely an end. With charts! 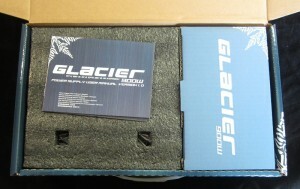 All told it’s a nice box, it isn’t obscenely flashy but it still has some marketing and pretty colors. The carrying handle is a nice touch, one that I would like to see other manufacturers adopting on their high end units. I’m assuming the glacier theme is to give the impression that the PSU runs cool, rather than that it is melting and threatening to flood coastal areas. 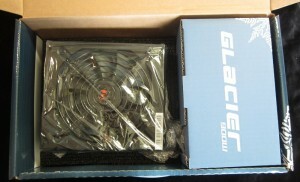 In any case it’s about time to open the box and see if the PSU looks like a glacier. I have to say that I would be absolutely psyched if it did. I found a PSU though! 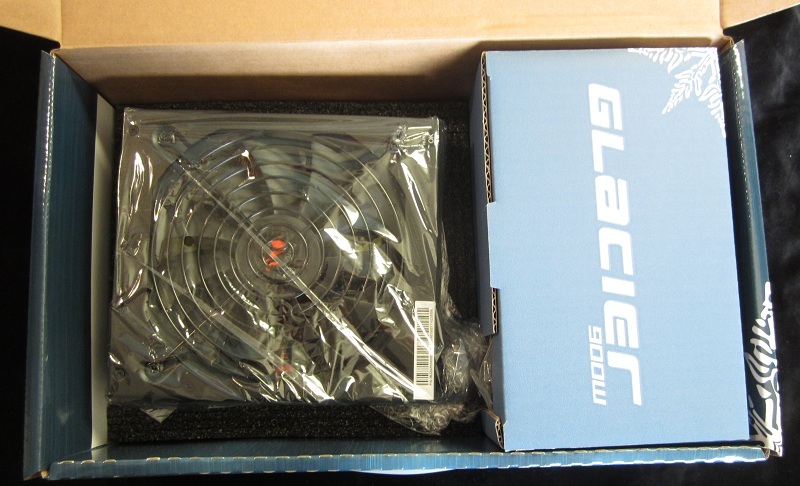 The InWin Glacier 900 W PSU does not look like a glacier. It does look like a PSU however, which is probably for the better anyway. This PSU is very well packed indeed! I would be quite surprised if it sustained any damage while packed like this. No small number of hardwired cables. The exhaust and wall plug end of things. The modular output plugs, nicely labeled. Shiny! Also difficult to photograph. The scratches on the top are all me, whoops. The shiny label really does look quite nice. I really do like that fan, it looks serious! 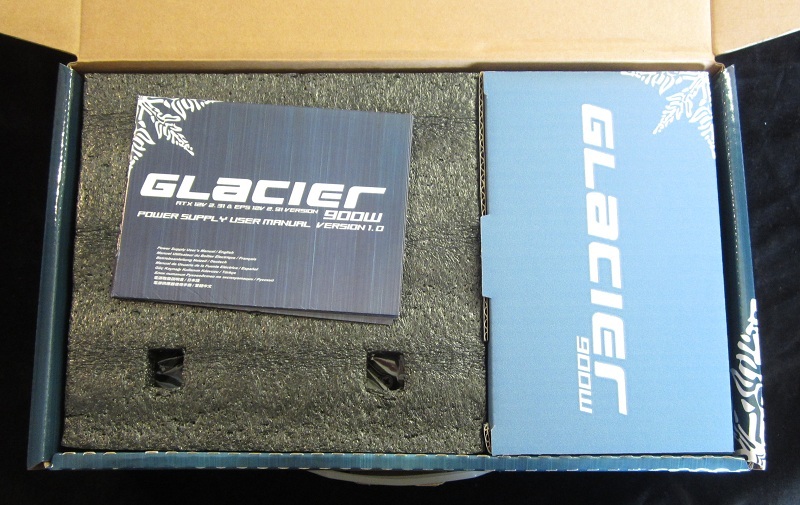 The Glacier 900 W has a nice matte black finish to it, with a bit of a texture to it. I would call it a “semi-crackle” finish. The distinguishing features are the Fan of Serious Looks and the nice shiny gold label. An interesting note is that the serial number stick is also the warranty-void-if-you-break-this-sticker-to-open-the-PSU sticker. I haven’t seen that before and I rather like it, that’s some efficiency right there. 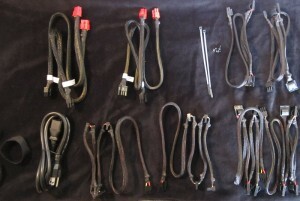 If you’re wondering about the cables you’re in luck, they’re next! An external cable tie. Sleeving goes all the way in though. I’m disappointed to see both a 4+4P CPU power connector and an EPS12V 8P CPU power connector hard wired. Very few boards use both and only server boards actually require both. Most users will have to stash one in their case somewhere. Other than that the hardwired cable selection looks quite good. 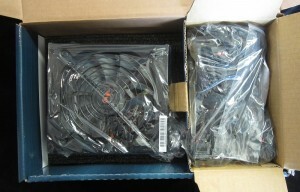 You get the two CPU power cables, two PCIe 6+2P power cables and the ATX20+4P main motherboard cable. 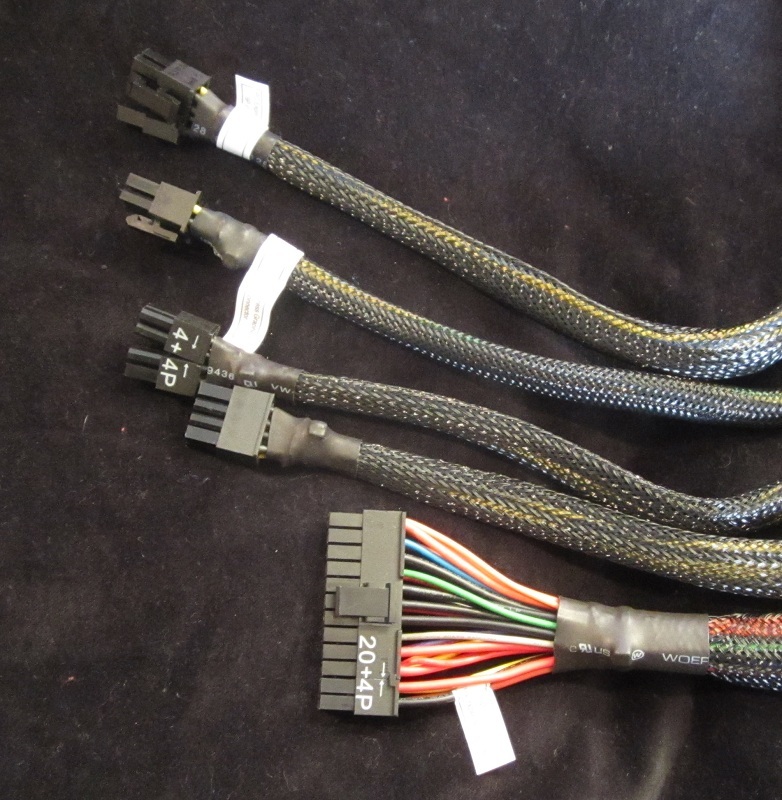 The modular cable selection is good, you got an additional four PCIe 6+2P power cables, two SATA cables with four connectors each, two Molex cables with four connectors each and two more Molex cables with two Molex plugs and a FDD power plug each. 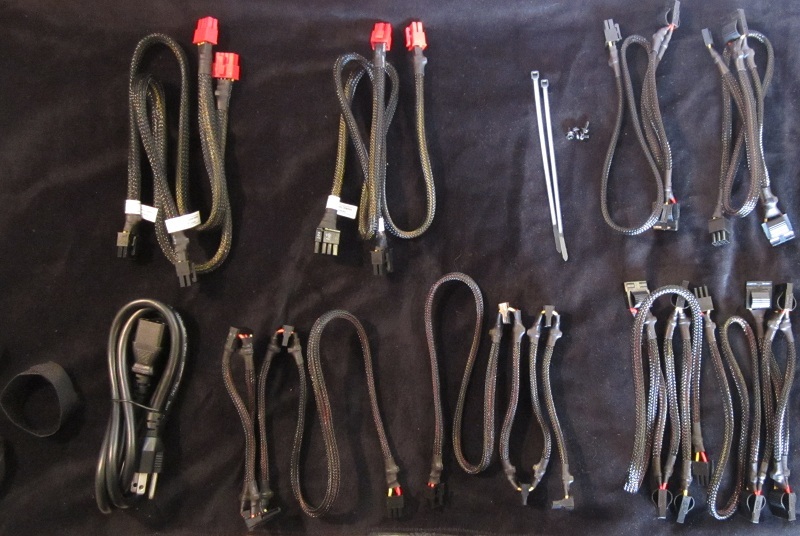 The box says eight Molex plugs, I count 12. Two of the PCIe power cables have eight pin connectors on the PSU end and two have six pin connectors. Why? I don’t know. 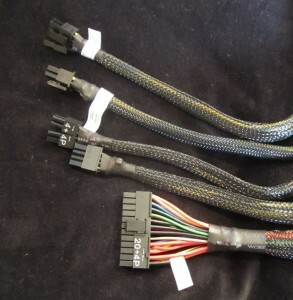 Realistically speaking six is fine, as there are only three 12 V and three ground wires that carry significant amounts of power, the other two ground wires in a PCIe 8P power cable are sense wires that tell the GPU that the connector is plugged in, but are not actually used as ground wires. 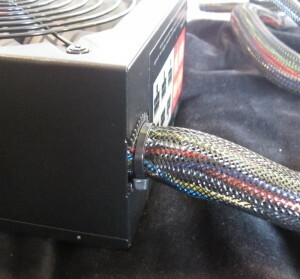 Oddly there is a cable tie holding the sleeving and wires together just outside the PSU, I suspect that it is supposed to be on the inside but slipped out during manufacturing or packaging as there is room for it to leave the PSU if it feels like it. 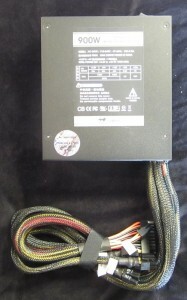 On the note of the sleeving, it looks great and goes all the way into the PSU and down to each plug. It doesn’t have any glue inside to hold it in place at the ends, just heatshrink. This could be a con if it slips up the cable and annoys you, or it could be a pro if you need to move the sleeving back a bit to shift the wires around for cable management. 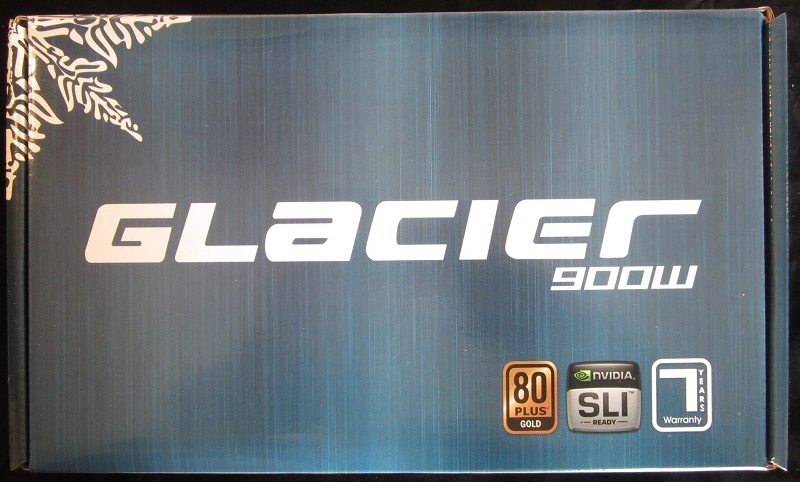 Also of note at this point is that I actually examined two of these PSUs, the first was an early production/review seed model from right when the Glacier 900 W was launched, the second is a recently built full retail flavor. The recent full retail model has two cable ties on the sleeving just before it leaves the PSU, rather than outside. As to why I looked at two units, we’ll get to that in the testing section. Speaking of which, I think it’s time to get to the testing. Testing will come in two parts, first up is load testing for voltage regulation. I’ll be loading the PSU with my home-built load tester consisting of power resistors bolted to a large and creatively designed water cooled heatsink. Being a purely resistive load it doesn’t introduce any ripple or other anomalies. 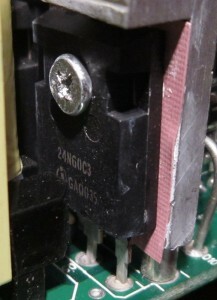 Voltages will be checked at the main ATX24P connector with a Cen-Tech #90899 multimeter. In this phase I will be looking at three things. 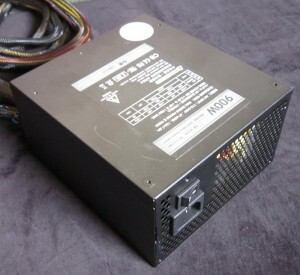 The most important thing is the ability of the PSU to put out the wattage it says it can. The second most important is how close to 12 V the 12 V rail stays, 5 V to 5V and so on, this is the regulation I spoke of moments ago. Last, there is the question of how hot the unit gets and how loud the fan is at full load. The ATX specifications call for voltage regulation to be within 5% of the rail voltage, so 12.6 V to 11.4 V on the 12 V rail, 5.25 V to 4.75 V on the 5 V rail and 3.465 V to 3.135 V on the 3.3 V rail. Ideally, we’ll see something lower, under 3% deviation is nice, under 1% is wonderful. The ATX spec doesn’t actually mention that the unit cannot explode at full load, I guess it’s assumed. With that out of the way I give you… Load test results! Now that is some regulation. 0.3% on the 12 V rail? Yes please. That’s including intentionally overloading the 12 V rail a bit to see what it thought about it. 5 V came in at a not quite as good, but still excellent 0.8%, while 3.3 V was in the middle at 0.6%. All around some tremendously good regulation. I never did hear the fan, that’s a good sign. 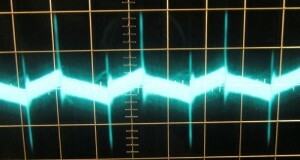 Ripple is the short duration deviation from the voltage average. 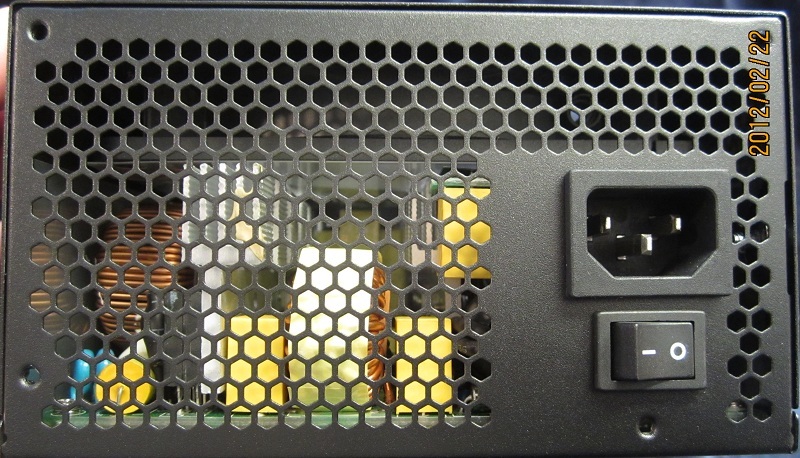 The way a modern SMPS PSU works means that some ripple is completely unavoidable. 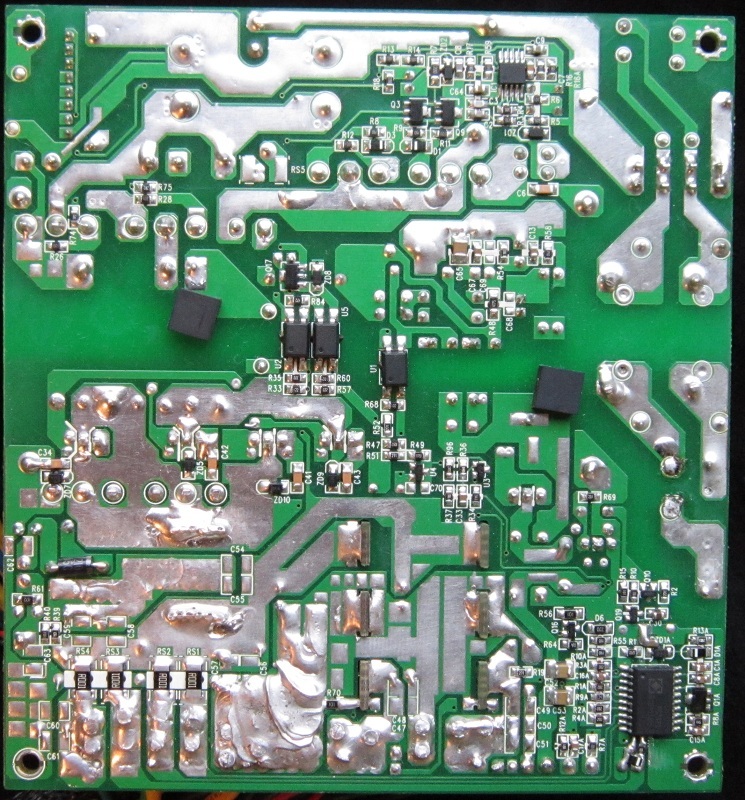 The ATX specifications call for a maximum of 120 millivolts (0.120 volts) of ripple on the 12 V rail and 50 millivolts on the 5 V and 3.3 V rails. Ripple comes in three flavors with three different causes. There is long duration ripple that is caused by the voltage regulator controller’s efforts to maintain an even voltage (they tend to overshoot), there is short duration ripple caused by the charging and discharging of the inductors and capacitors and then there is really short duration ripple (I call it transient ripple) caused by the switching of power to those inductors. The first sort isn’t always present in meaningful amounts, the second sort you flat out cannot get away from in a SMPS unit, and the third can be quite difficult to control. 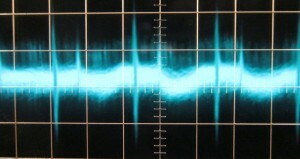 The first and second sorts are quite important, while the transient ripple is less of an issue. The ATX specifications call for all forms of ripple to be within the 120 mV/50 mV numbers in the above paragraph however. I tested ripple at three load levels, first with 48 W of load on the 12 V rail, then with the unit fully loaded and last with a heavy 12 V crossload. The 48 W load for the low level test is because the unit is not rated for zero load operation, because of that and the fact that zero load will never happen in normal use I gave the unit something to chew on. 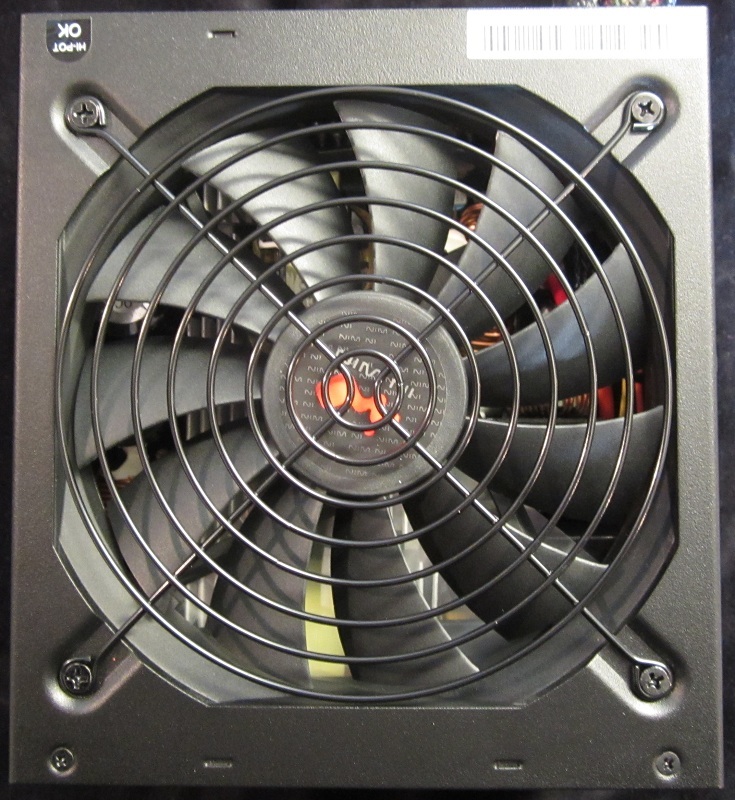 Were the PSU rated for zero load operation it would be tested there, unrealistic or not! Low load shots are on the left, full load are on the right. In all the shots the scope is set to 5 microseconds per divider (left/right axis), in the low load shots it is set to 10 mV/divider (vertical axis) while in the full load it is set to 50 mV/divider. 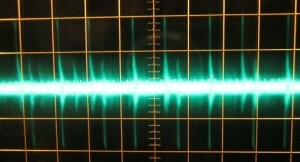 12 V low load, 40 mV of ripple. 12 V full unit load, 188 mV. 5 V full unit load, 180 mV. 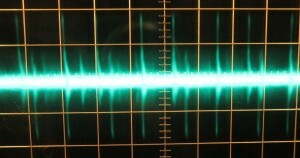 3.3 V low load, 34 mV. 3.3 V full unit load, 198 mV. Houston, we have a problem here. Low load ripple is okay, it’s within spec by a decent amount. I’d like to see less on 5 V and 3.3 V, but it’s all fine. With the unit fully loaded however, there are issues. The 12 V is out of spec by 68 mV, I’m willing to let that slide when I consider the amazing voltage regulation. 5 V is out of spec by 130 mV, which is rather hard to ignore. Harder still is the 3.3 V rail being out of spec by 148 mV, almost 0.2 V of ripple is far too much for the poor 3.3 V rail. 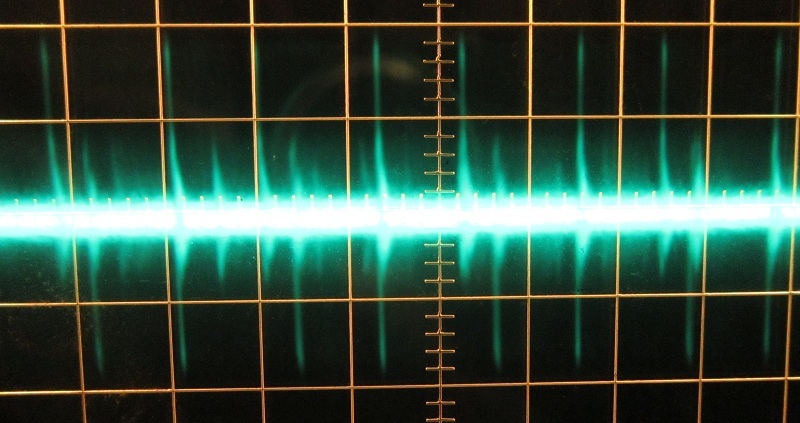 I spent some time with my scope tracking down the source of the ripple and it all comes down to the switching of the 12 V rail, as you can see in the scope shots there are some impressive transients caused by switching the power on and off in the transformer. The output filter capacitors don’t seem to be able to mop it up, and it gets passed right on to the DC-DC regulators for the 5 V and 3.3 V rails. They can’t get rid of it either and it comes right back out of them into the 5 V and 3.3 V rails. 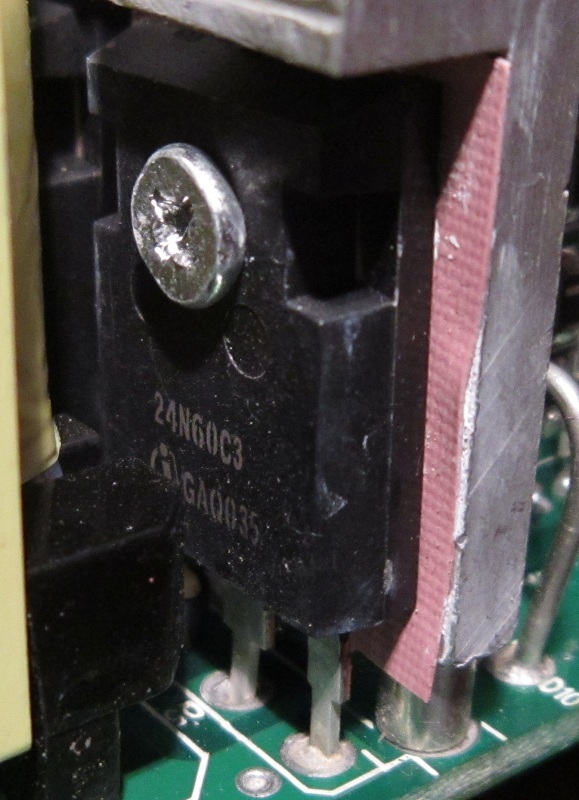 Unfortunately, what was out of spec by a decent bit on the 12 V rail is far beyond spec on the lower voltage rails. 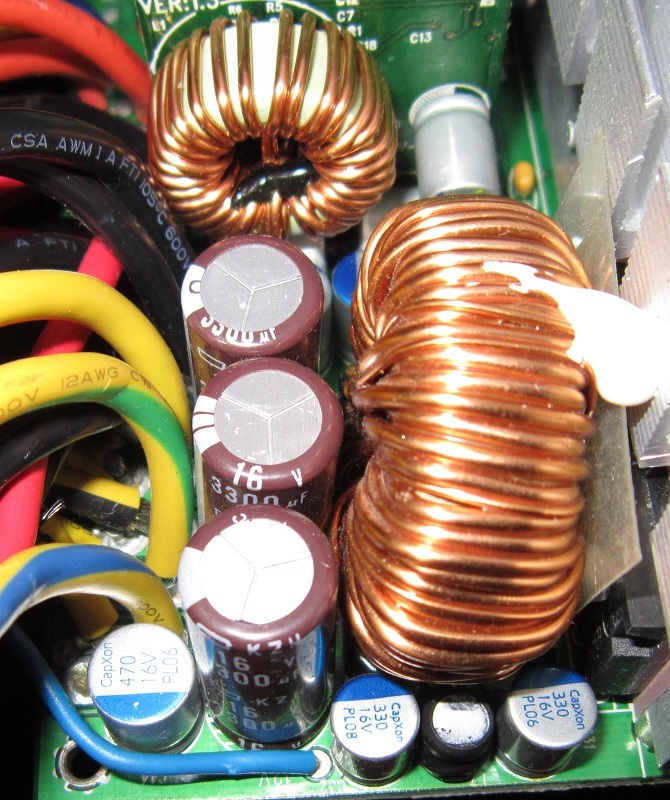 When we get to the dissection section we’ll take a hard look at the output filter capacitors and see what they’re up to. When I alerted InWin to the ripple issue they responded in standard (for the PSU world, at least) form by sending a second unit for me to test, hence my having two units. Unfortunately, the second unit had the same ripple issues, implying that it is a design issue rather than a defective unit. 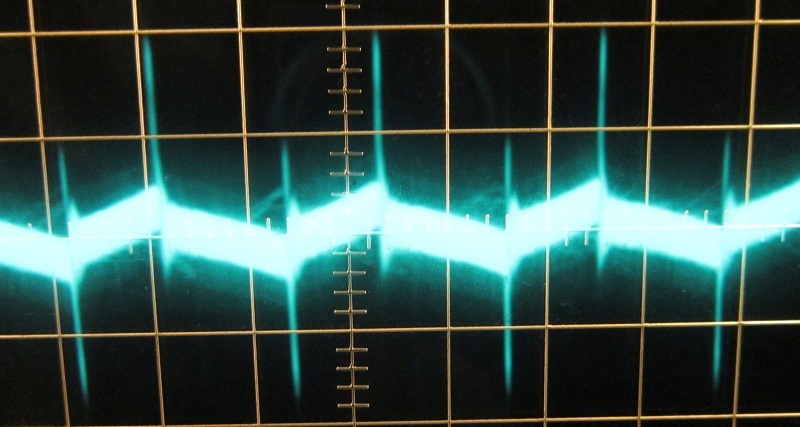 Transient ripple is far less likely to cause issues than the other sorts, but some lower voltage devices may dislike having a significant portion of their input voltage slammed around. 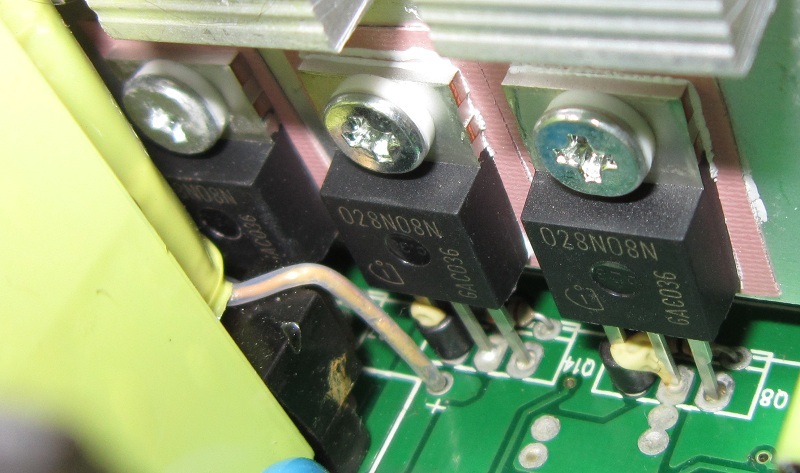 Disclaimer: Power supplies can have dangerous voltages inside them even after being unplugged, DO NOT OPEN POWER SUPPLIES. It’s just not a good idea, and doing so could very well kill you. Don’t try this at home. Don’t try this at work. Just don’t do it. I’ll start with the fan, as it is the first bit I have to remove anyway. Don’t see Globe Fan as often as some other brands. As usual these days there is some plastic to prevent air from sneaking right out the exhaust grill. Thankfully, I did not find any mammoths, I can certify this PSU as mammoth-free. With the fan out of the way (quite literally), we’ll go through the PSU and follow the power on it’s somewhat torturous path from the wall to the output wires. 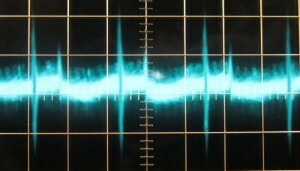 That means we start with the input transient filter. Its job is to mop up transients in the incoming AC so that the rest of the PSU can have a nice smooth sine wave to work with. 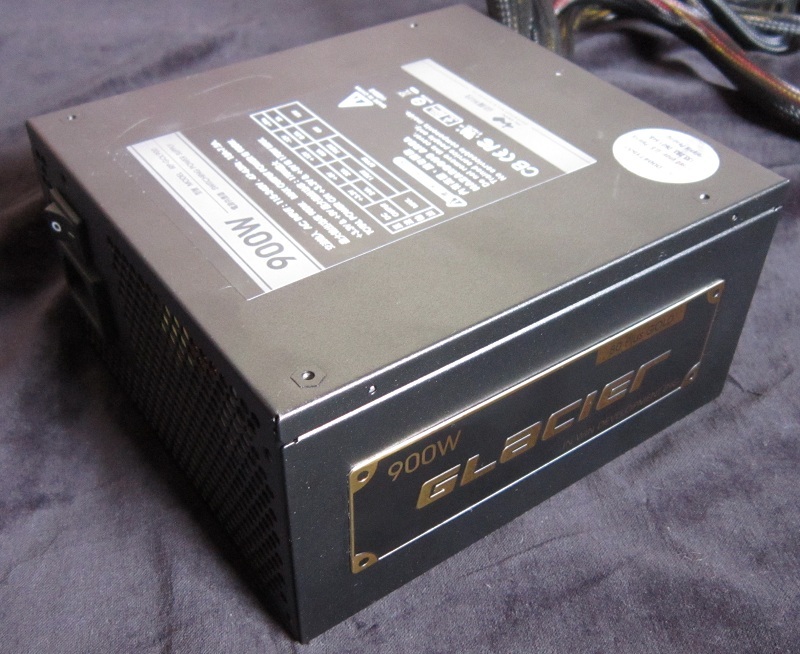 Most PSUs have some of the transient filter attached to the receptacle on the back of the PSU and the Glacier 900 W is no exception. The receptacle's portion of the transient filter. 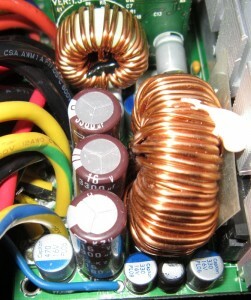 Two X capacitors (yellow boxes), two Y capacitors (blue doodads), one inductor (copper coil wrapped in light yellow plastic). 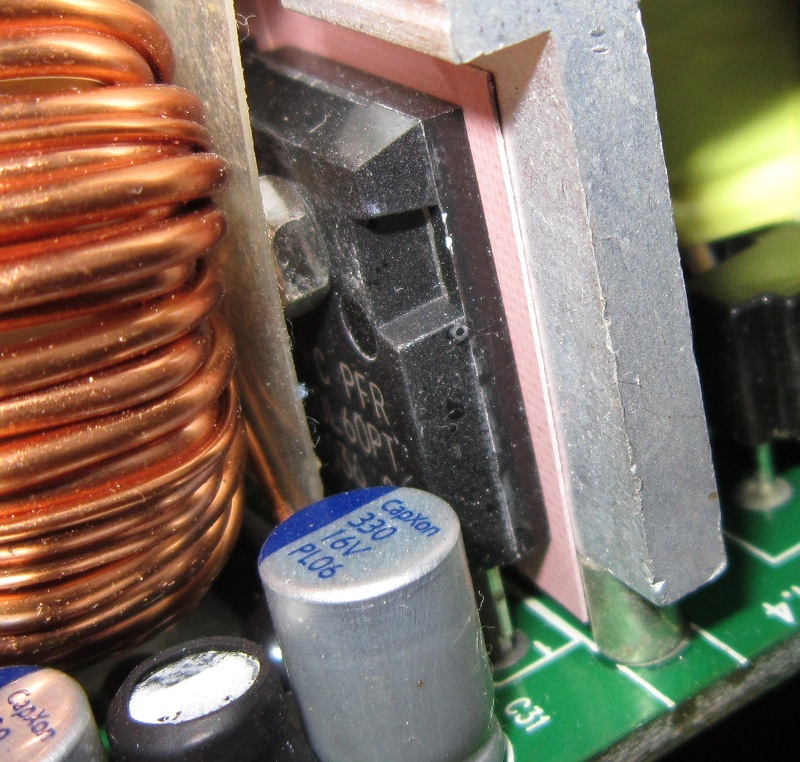 Also a grounded copper shield that sits between the receptacle and the 3.3 V DC-DC conversion daughterboard. 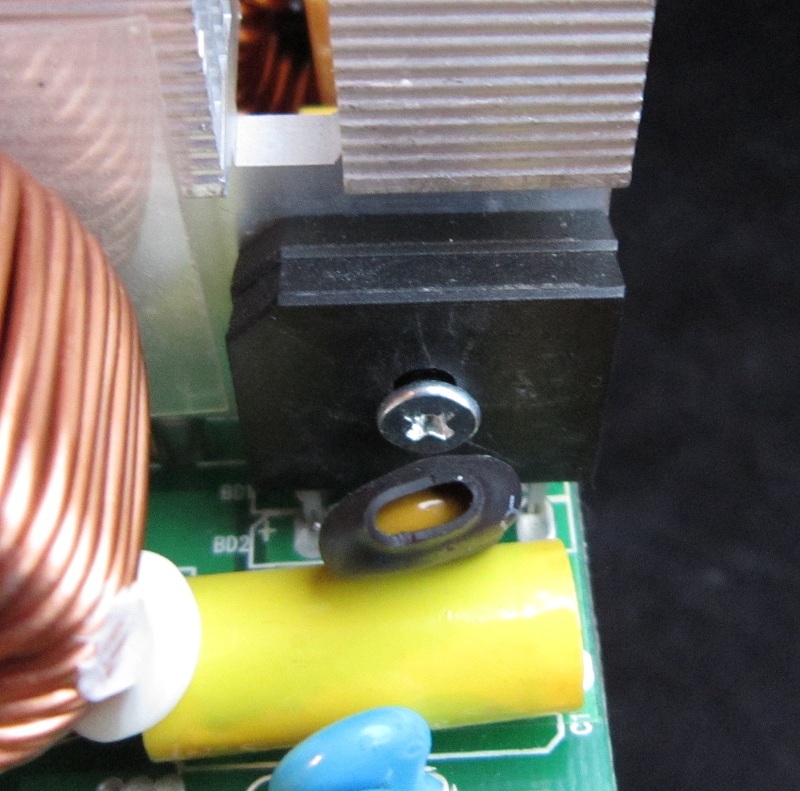 On the wires to the main PCB we see a ferrite bead. 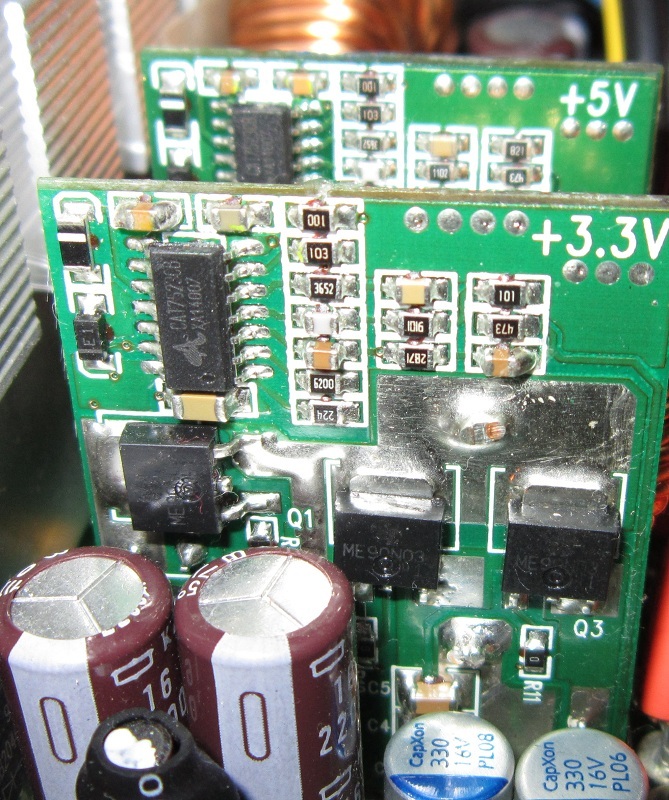 In case the receptacle’s transient filter isn’t enough there is more on the main PCB! 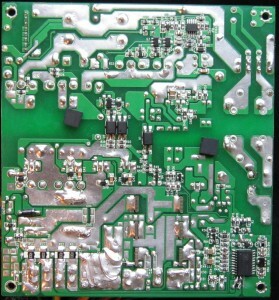 Main PCB's portion of the transient filter. 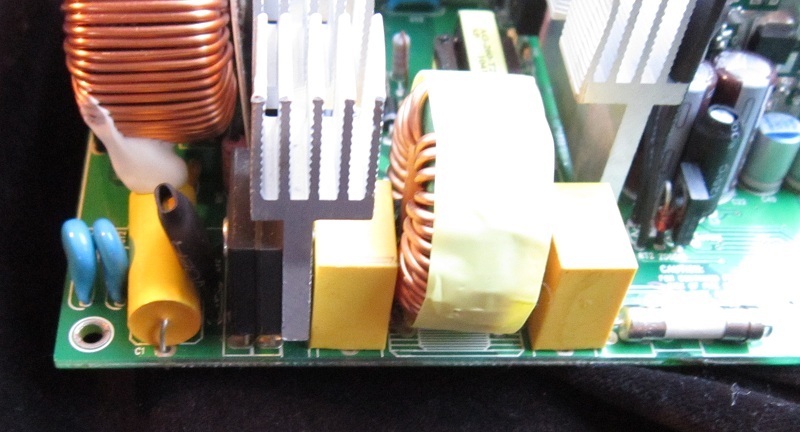 Two more X capacitors, two more Y capacitors, another inductor and lastly a MOV for surge protection. In the above picture, we also see the rectifiers from the side. 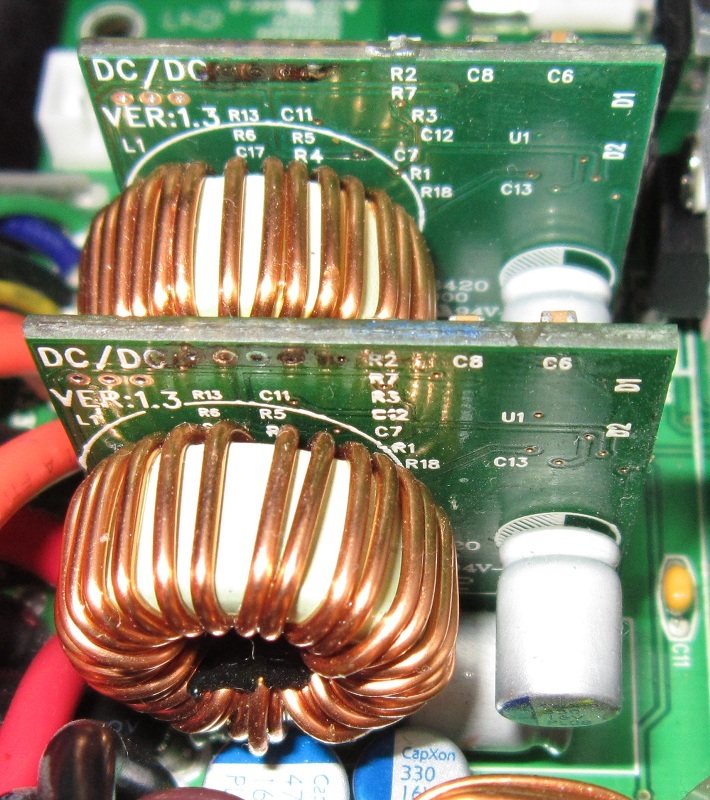 Next come said rectifiers and the APFC circuit. 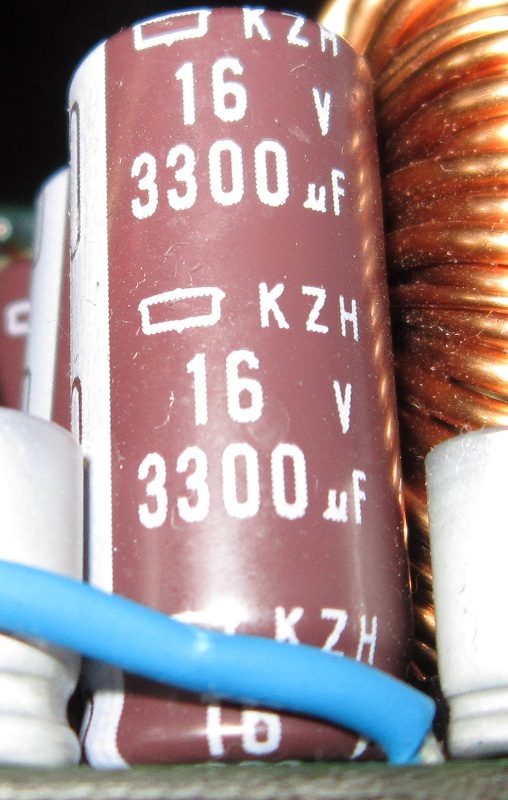 Unfortunately, the rectifiers are either unlabeled or facing the wrong direction for me to see the markings, so their identification is a mystery. 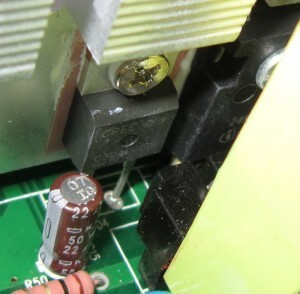 The yellow tube is an X capacitor on the rectifier output to clean up transients (again…) caused by the diode’s in the rectifiers switching on and off. 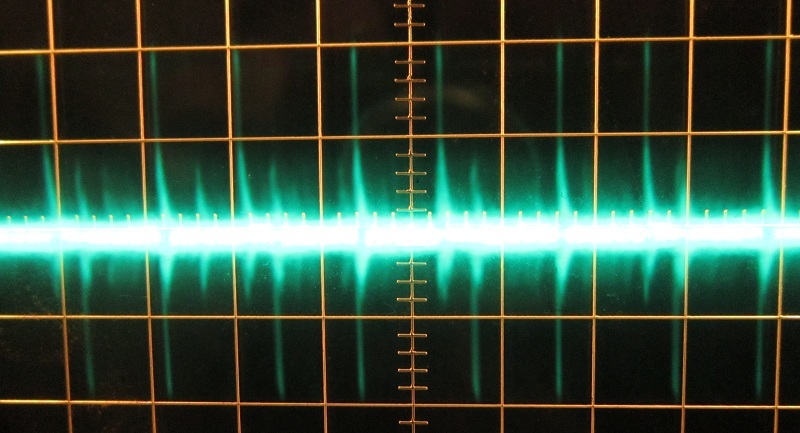 Diodes are noisy beasts, oddly enough. The APFC is tasked with taking the newly rectified voltage and bumping it up to something in the high 300 V range, it then stores it in the bulk storage capacitors. If you think back to the features section you’ll remember that the bulk storage caps were claimed to be Japanese solid capacitors. These are definitely Japanese, but look to be standard electrolytic capacitors. There is absolutely nothing wrong with electrolytic capacitors in this application, why the box attempted to mislead us is beyond me. An overview of the APFC unit. The APFC's switches hide behind the inductor. The brains of the APFC. The switches are a pair of 32N50C3 MOSFETs (32 A @ 25 °C, 20 A @ 100 °C, 560 V), the boost diode is a Cree C3D10060 (10 A, 600 V). The storage caps are Rubycon 105 °C rated units. Next the power is sent on its way through the main transformer by the main switches, a pair of 24N60C3 MOSFETs (24 A @ 25 °C, 15 A @ 100 °C, 650 V). After that it is rectified into 12 V DC by four 028N08N MOSFETs (100 A 80 V), two 60L60PT Schottky diodes do extra rectification duty. I cannot find a datasheet for the Schottkys, but based on their part number I would guess 60 amps and 60 volts. One of the main switches. Most of the rectifying MOSFETs. At this point the power hits the output filter capacitors, there are three large electrolytic caps and a smattering of smaller polymer caps. 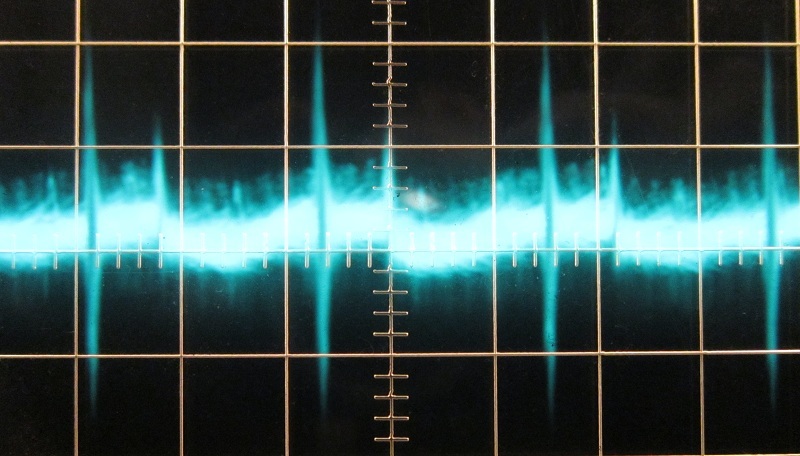 I suspect that more and/or varying sizes of capacitors would have had a better time mopping the ripple transients up. 12 V output filter section. 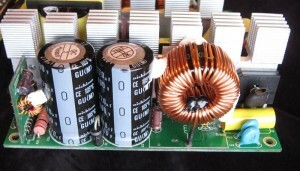 A closeup of one of the large electrolytic caps. 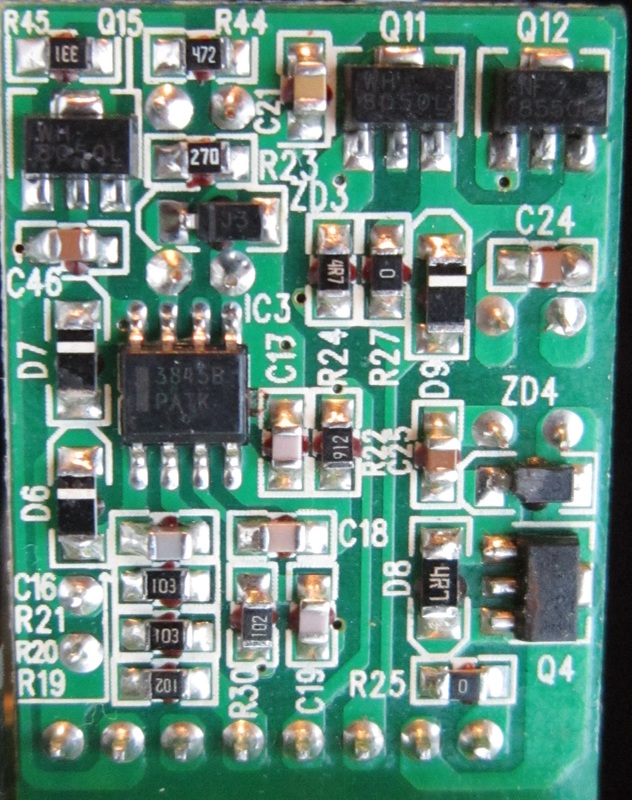 The 5 V and 3.3 V boards are nearly identical, both feature four 90N03 MOSFETs (60 A @ 25 °C, 47 A @ 70 °C, 30 V) in a standard buck regulator setup. Lastly, there is a thermistor for the fan control circuit as well as the storage caps for the 5 Vsb rail. Fan thermistor and 5 Vsb caps. Okay I lied, that wasn’t actually the last bit, we need to look at the modular output board and the soldering on this whole operation. Note that this is the second PSU that I am examining, it is a full retail unit unlike the first I got which was a pre-production or early production sort of thing. The pre-production version was entirely hand soldered and quite excessive and messy. 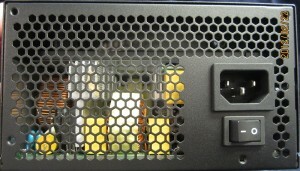 Plug side of the modular output board. Soldering on the modular PCB. We have a few thing going on here, to kick things off the modular PCB has an extra polymer cap per rail, that’s a nice touch. The soldering on the modular PCB looks great on the whole, where the wires go in is hand soldered and a bit messy but nothing serious. 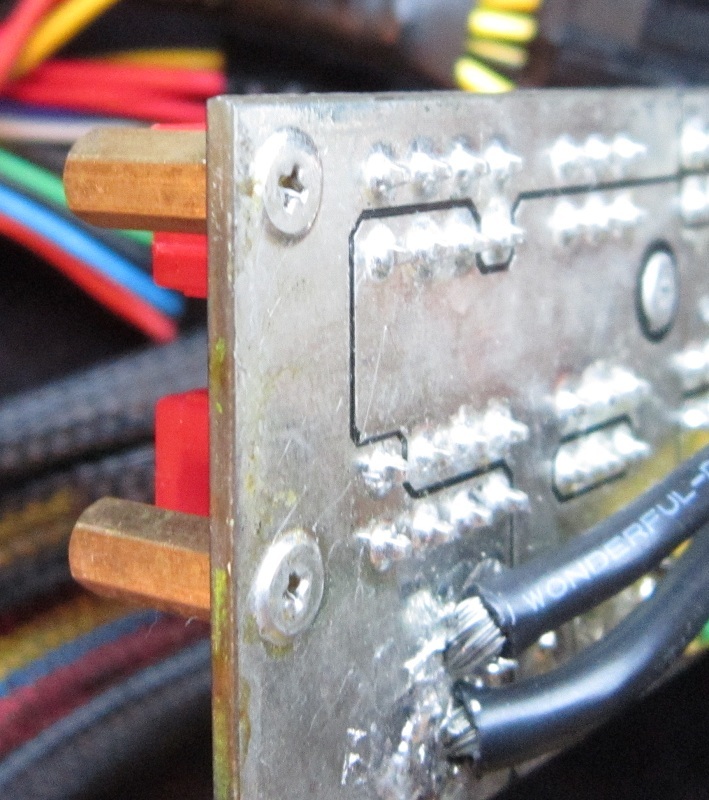 The screws that hold the standoffs in place are soldered in, then the standoffs are threaded onto that, lastly there are more screws that go in through the PSU’s case into the standoffs. The standoffs wanted to come off the soldered screws rather than the external screws when I was pulling the unit apart, annoying for me but not an issue for most people. The main PCB soldering is good by and large, there are a couple areas of hand soldering that could be prettier, but I don’t see anything offensive. 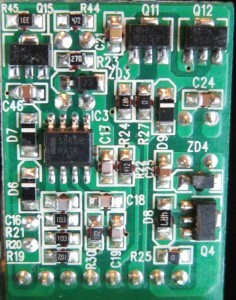 Interestingly the PCB is set up for four 12 V rails. There are a few long component leads, but nothing serious. 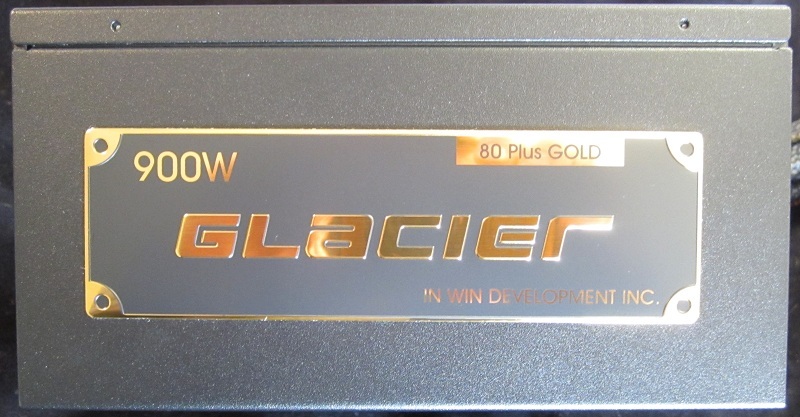 The InWin Glacier 900 W power supply has been a real roller coaster to review, it has a number of features I like quite a bit and some things I really rather don’t. I’ll hit a few of the high and low points, then it’s pro/con time! 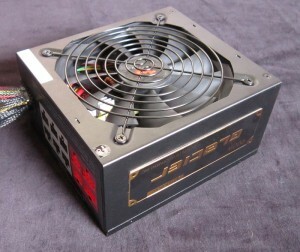 The PSU looks great, it has a nice slightly-crackly black matte finish and a gloriously shiny gold label on one side. The cables are sleeved rather nicely, though the sleeving not being glued to the end of the cables may annoy some people. The choice of two hardwired CPU power connectors annoys me. The voltage regulation is fantastic, I am very impressed on that front! The ripple control, however, has some rather serious issues, 3.3 V is almost four times the maximum spec and 5 V isn’t far behind. 12 V is closer to spec but still well over it. The fan is very quiet, no issues there. 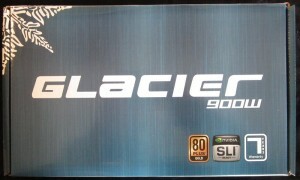 I can only find one retailer selling the Glacier 900 W and that is InWin themselves. They want $230 for it, which seems excessive. 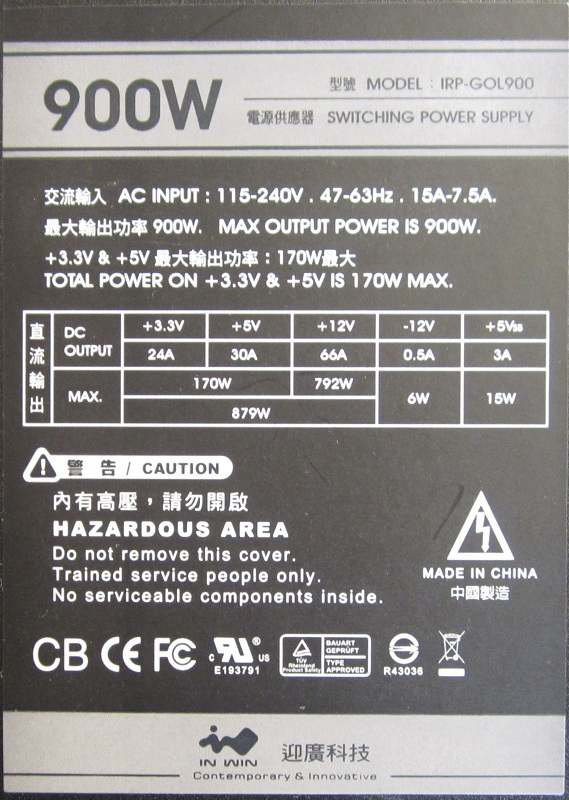 800 W of 12 V on a 900 W DC-DC regulated unit is odd, I wouldn’t call it major issue, but I would expect more. Looks nice. Sleeving is nice as well. 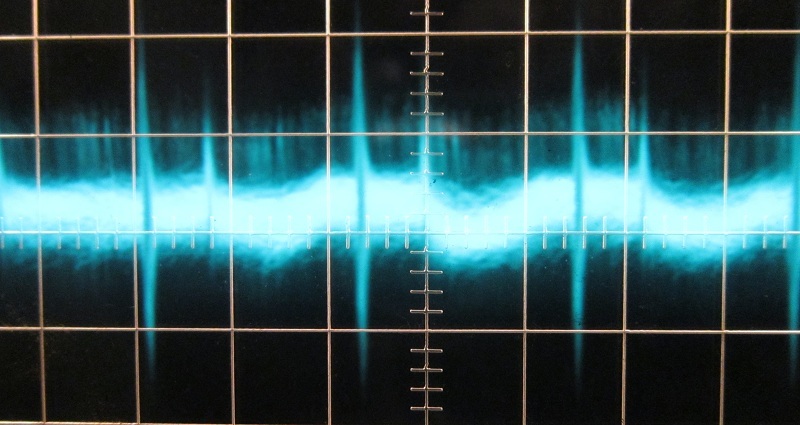 Ripple has transients far over spec on all rails. Short on 12 V wattage for a 900 W unit in this price range. Price is excessive by at least $30. 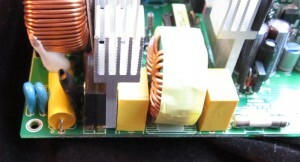 Two hardwired CPU power connectors. All told InWin was close with this unit, if they can make a V2 out of it that gets the ripple under control and cuts $20-30 off the price they’ll have a solid unit. As it is I am forced to apply the Meh stamp, as painful as it might be given the voltage regulation results. 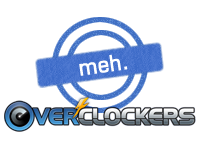 I highly recommend clicking the Meh and reading the page it links to as that explains the Overclockers.com rating system and what the ratings really mean. As mentioned in the review, I would love to see a Glacier V2 that takes care of the transients and lowers the price a bit, that'd make for a solid PSU.